The most important tools are the ones you use every day. In the world of software development, no tool is more ubiquitous and necessary as the text editor. Usually the first and last program used by developers in the working day, software editors are a vital part of the developer toolkit, and one which emphatically does not get enough love! A recent study conducted by StackOverflow shared insights into text editor and OS preference in their community. 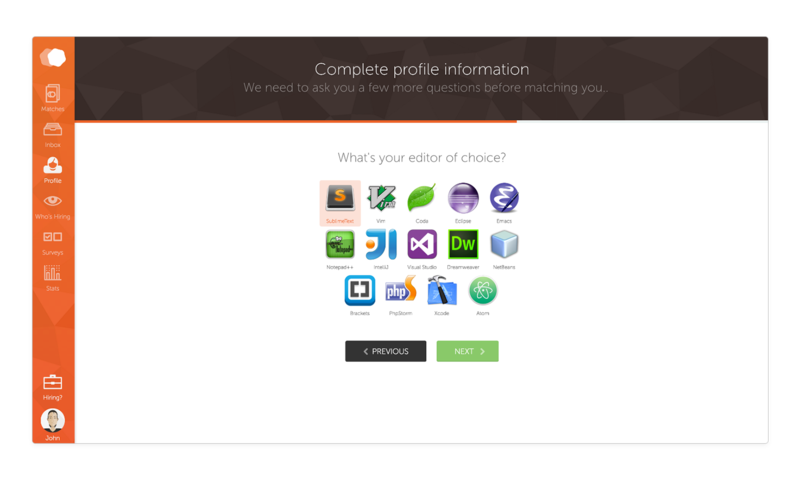 In this post we look at: Was there any association between choice of editor and preferred OS? What other technology associations were there? Did developers who chose different editors actually spend time differently on the job? We use this information to enrichen User profiles by showing badges with OS and editor icons, making them look more personalised and detailed. It also allows us analyse the data and learn more about the community on our platform. As always, we're happy to share what we know and hope to provide a little piece of insight about the tech landscape we all belong to. We're doing this with a reasonably small dataset, so don't take anything you see as statistically or globally relevant - it's just a bit of fun! Our Users are prompted to pick their 'editor of choice' from a list of 14 - Since the feature has been added (a few months ago) to current date (29 March 2016) a running total of 3103 Developers have selected their preferences. We don't think it will come as much of a surprise to anyone that SublimeText came top in the popularity stakes though it's impressive to see how Atom.io makes the second position, particularly given how young it is (publicly released in Feb 2014 vs 2008 for SublimeText). Given that Atom and Sublime Text both have a clear focus on design and customisation, we think it is a fair assessment to say these are key reasons as to their popularity over other text editors. 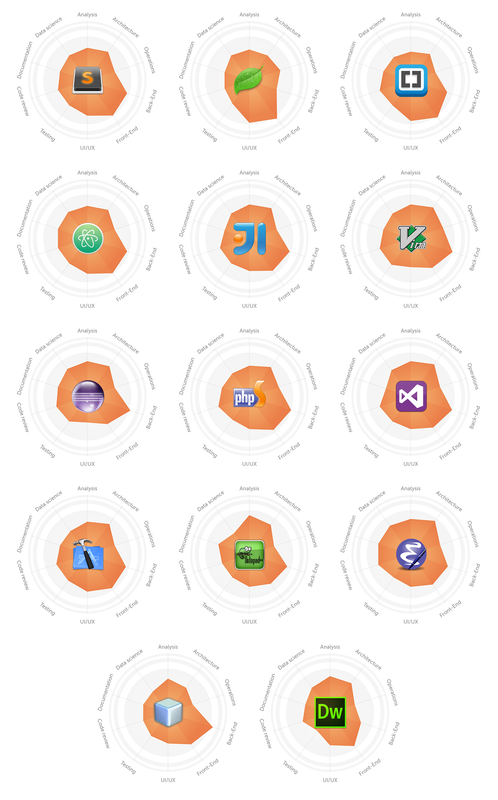 With our developer population heavily weighted towards web technologies - no surprises there - we were quite surprised to see IntelliJ IDEA being in third position, which is typically an IDE for developing on the Java Virtual Machine. It's position aside though, if we look to some historical data about Java tools, our results suggest that IntelliJ continues to make gains in the Java world (This article from 2014 shows that Eclipse had larger adoption - 48% vs 33% of the market). This may suggest why IntelliJ IDEA ranks so highly, as it may be very common for anyone working in Java world to default to it these days, rather than when working with other programming languages (we don't have much knowledge of the Java world, so we would welcome anyone's insight on this!). Following the top 3 we see VIM is the editor of choice for about 11%. This highlights it's resilience and popularity in the industry still with some developers choosing to fully emerge themselves inside their terminals. After VIM, we see Visual Studio, PHP Storm and XCode, which are text editors with a bias towards particular programming languages. 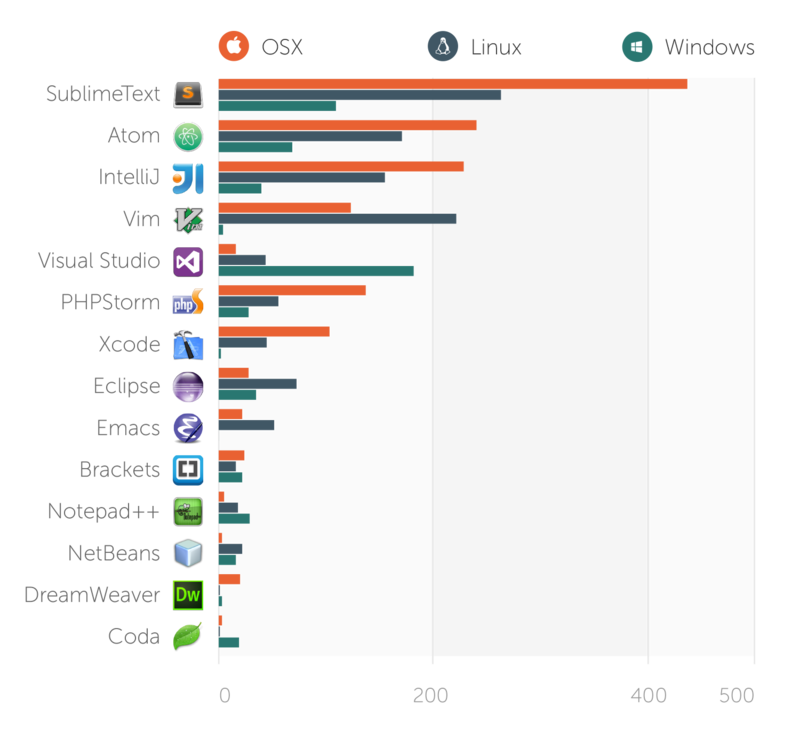 In terms of OS, it's unsurprising to see Unix based systems being the choice of most Developers, with OSX on top position. Whilst our audience does include software engineers of all stripes, our core demographic are web app engineers who are natives to the open source world. 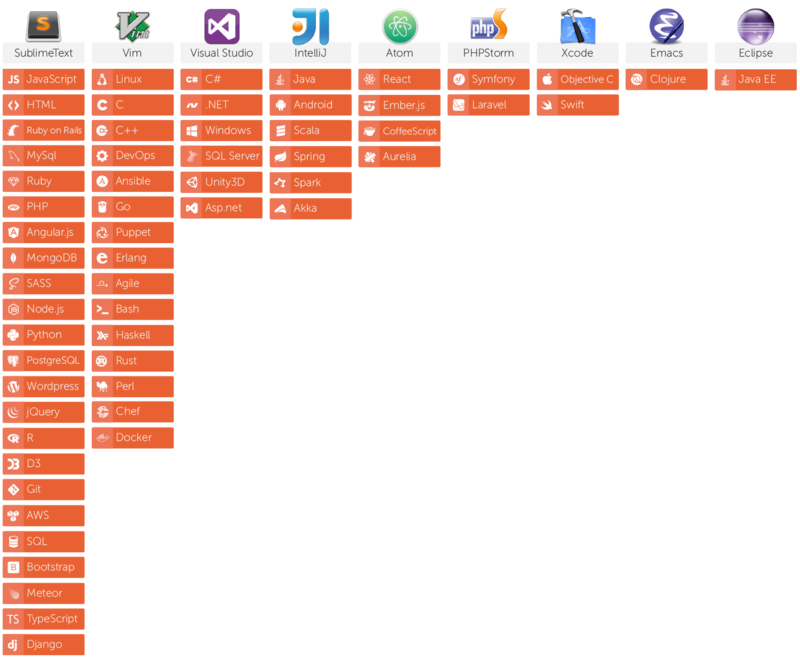 The following chart shows the OS of choice distribution over each proposed editor. For Sublime Text, Atom and IntelliJ you can see that there is no departure in terms of operating system of choice, with each result showing a clear correllation to overall OS distribution in our user base. 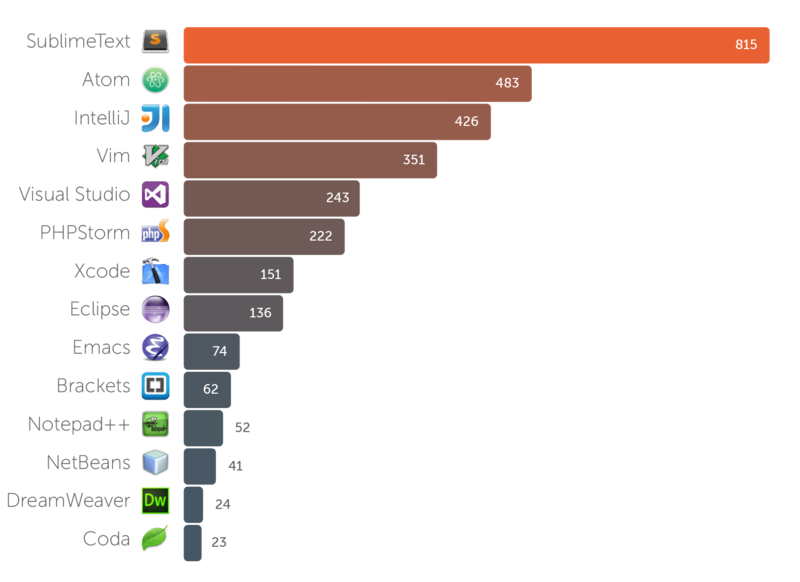 However for VIM, Eclipse, Emacs and Netbeans there appears to be a leaning towards using these text editors on Linux based system which highlights their relative popularity with people using this OS. The same can be observed for Visual Studio and Notepad++ which are more popular with Windows based developers. We also decided to group skills under editor preferences - each of the following skills has been added under the editor that was the most common choice amongs users that picked said skill. The choice of skills included in the chart is based on whether they managed to be associated to the same editor at least N times in the time of the experiment. The sorting order is not relevant. And since at Workshape.io we're all about describing Developer's work through visual representations, here's the average shape of our Developers for each of the editors of choice. Since we're looking at averages between hundreds of Developers the differences are subtle, although you can spot some small variations in the type of work that developers do with different editors and make a few assumptions. For example, Atom.io seems pretty popular among Front-end and UI/UX oriented Developers, Eclipse is mostly used for Back-end, Visual Studio users seem generally less inclined towards Documentation and very focused on Architecture. Speculations of course, but interesting to think about whether and how small preferences might signal more significant patterns of behaviour. We'll know more about this, as we continue to onboard more developers onto our service. Last but not least, the following shapes show the average of the Developers of each OS of choice - Since they are very close together, the shape of each OS is highlighted in orange with the other two overlayed in lightblue to highlight the differences in more detail. As you can see, Developers that would choose OSX tend to show more interest towards UI/UX and Front-End, Linux users lean more towards Operations, Data Science and Documentation and Windows users tend to be more balanced between the two. We hope you've enjoyed this post, as much as we have in putting it together. If you like this sort of content, please do let us know - we'll keep making if you like it/find it useful! Don't forget to visit us at Workshape.io and feel free to share this post!